5330/6D Kinsmart - 1955 Chevy Stepside Pickup Truck. 1:32 scale diecast collectible model car. 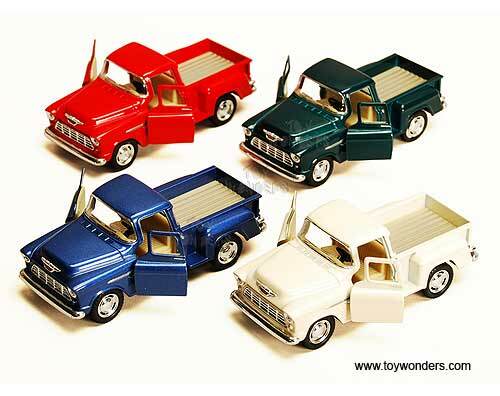 The Chevrolet Stepside pick up is a 4.75"L x 2"W x 1.75"H diecast metal car with openable doors, and pullback motor action. 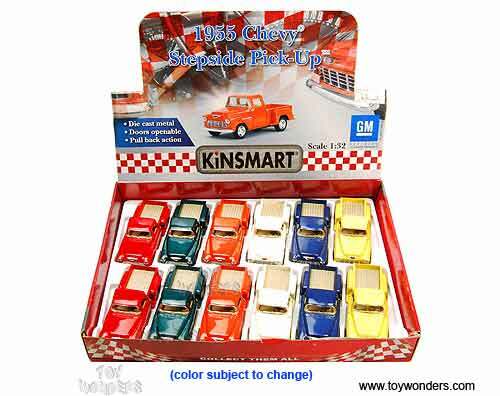 This 55 Chevy Stepside Pickup is manufactured by Kinsmart. 12 pcs per display box and in assorted colors. 72 pcs per inner box. GM is a trademark of the General Motors Corporation.